Suddenly Huet excused himself and disappeared from the room. He returned with a bottle and three glasses. “This is one of the reasons I am against the train,” he said, holding the unlabeled bottle out to us. It was streaked with cobwebs and covered with dust. Without saying another word, Huet pulled the cork and began to pour. The wine was brilliant gold in color. We looked at each other in anticipation, then at Huet. A faint smile had crossed his face. “Go on, try it,” he said. The first sip left no doubt in our minds that we were tasting something extraordinary. The wine was dazzling. It was lusciously sweet, yet so fresh and alive one might have thought it had been made yesterday, and we told him so. The wine tasted was made in 1947. The train mentioned was France’s high speed train, the TGV, which Gaston Huet, winemaker at Huet and mayor of Vouvray, was opposing in defense of his heritage, vineyards, and wines stored in limestone caves which the TGV line would run right through. Wine & War is full of adventure, a read that was suggested to me by my boss. So far I am completely digging its badass tales of French vignerons’ endless dedication to their craft in the face of all the danger, sadness, and uncertainty that comes with war. It solidly proves a point that constantly arises when wine is involved- wine is so much more than wine. Early in the introduction this producer from France’s Loire Region, in the appellation of Vouvray, called Domaine Huet, is mentioned. Huet, ah! Just the name activates my imagination. I can practically taste the crisp beauty of their sparkling wines made from one of, in my mind, the most capable grapes- chenin blanc. Huet is currently a third generation producer that has really led the way in Vouvray. In 1928, Victor and Anna-Constance Huet purchased their property, an estate that now consists of about 35 hectares, including some excellent single vineyards- Le Haut Lieu, Le Clos du Bourg, and Le Mont. Huet’s land is farmed biodynamically, paying every bit of attention possible to cultivating its health and longevity. Huet trusts that these practices yield the most excellent wines, a modus operandi that has proved so worthwhile. I first tasted a wine from Domaine Huet about two years ago, their Petillant Brut. It had been suggested to me by the buyer and manager, Justin, at one of my favorite neighborhood shops, Uva Wines. When Justin heard that I had never tasted Huet, that I didn’t even know Huet, he looked at me with an expression that said- how have you possibly lived all of these years without knowing the beauty of Huet?! He was right; the wine was fantastic. Truly something to write home about (hi Mom! ), and to taste time and time again. It is especially something to celebrate with…happy 2012? I think so. It is also reasonably priced considering its great quality, usually coming in between $22 and $35 depending on vintage. You can purchase the 2005 Petillant Brut straight from Uva, as well as many other in the Huet line: http://www.uvawines.com/shop/search.php?mode=search&page=1. Can you see Vouvray? 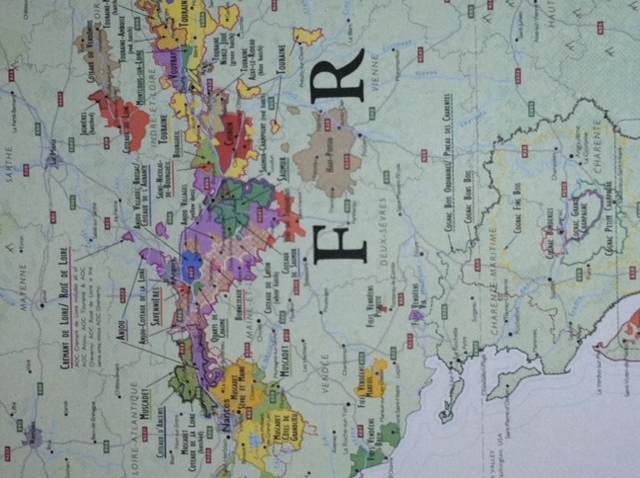 It is the little purple appellation next to Touraine toward the top right corner.